I’ve never been backed by a string quartet before – and George Haydock’s meditative short film below is probably the only time in my life that it’s going to happen. It’s always disconcerting watching yourself. And there’s a moment in this where I suddenly realised where my sentence was going to take me and couldn’t resist a smile (it’s the point about Salford docks exporting itself until only emptiness was left). Hopefully it doesn’t look smug (it’s borderline I think). I developed a new-found respect for TV presenters that day – that art of keeping on talking, and thinking – with just the right buffer between the two. So, there I was – an overgrown pixie – sitting on a rock for an hour and half trying to constantly think of something more to say about this overgrown and unregenerated wasteland portion of Salford docks. I’d also been speaking earlier that day at a National Water Safety Forum symposium at The Lowry (in the now rather scuffed looking – regenerated – portion of the docks) on drownings in inland waterways, so my head was already in a strange place (and my body in a suit). Earlier that day I’d travelled up and down the quays in a boat, my RoSPA colleague pointing out all of the locations at which adventurous water users had come unstuck, some fatally. Every few minutes we had to stop filming, as a tram trundled past. Occasionally it was a jogger or dog walker who provoked the pause. Having to sit on a rock and talk about a place that you’ve never visited before is actually quite difficult. There’s almost something fakir-like about it; a trial of endurance. An endurance taking me towards revelation? So, I eventually realised that the big point (my attempt at a ‘big’ point at least) about Pomona was that there is no big point. It is a pause place, a gap in the intense meaning otherwise foisted on the landscape in the city making, regeneration, repurposing. Pomona just ‘is’. So, Pomona shows us that flux that is the succession of urban uses that any ground can testify to. But Pomona shows that procession in a freeze-frame. The recirculation is slower. The docks have lain empty for 40 years, and when they arrived in the early Twentieth century they displaced a range of earlier leisure uses formerly of this boundary between Salford and Manchester, including Pomona gardens and zoo. Very fitting then, that ending to the film, that ‘cast of thousands’ – but I won’t spoil the surprise. “Most human activities produce marks in the physical world. The site bounded by Matthew Street and Doncaster Street had many lives before it became Furnace Park. My interest is in how different types of people try to trace back into this layering of past uses and how and why they do it. In my research I study this trace-work as it is undertaken both by professionals (surveyors, engineers, planners, developers) and enthusiasts (amateur archaeologists, urban explorers, psychogeographers, poets and curious passerbys). In each case this trace-work involves staring intently – either on site or in an archive – to try and bring to the surface the site’s former use and arrangements, something only now hinted at in the site’s current state. In each case the attention paid to the ‘lost past’ of the site is directed towards making it better known, more deeply understood. For the professionals that knowledge has very practical aims and benefits. Knowing the site’s past enables costly future problems to be anticipated and managed in any ensuing redevelopment. For the enthusiasts it presents something a little more intangible. Some seek to ‘know’ the site in terms of preserving its histories and its stories, for others is it more poetic – enabling a more open, flowing engagement with this place through tracing the rich colour and diversity of its former lives. For these, showing that a site has been many things over a recorded span of history prompts the viewer pause at the gates of this currently scrubland site and to see quite different things through the railings – the ghosts of former uses, arrangements and activities that once took place there. The Furnace Park site is particularly rich in its layers – and once you start digging through them (whether physically or in the archive) many versions of use and arrangement tumble forth. Yet there is little currently at this site to suggest that this would be so. The site sits now in an unloved, overlooked corner of the city surrounded by change (industrial units giving way to apartment blocks) but the site itself sits dishevelled and static. It is an ‘L’ shaped plot of made ground, weeds and remnant brick walls. Digging into the history of the site is not about hoping to find and restore a more noble or more fully engaged era of use of this site. There is no golden age to excavate. In the most cases the former uses were mundane – places of work and play, day-in day-out places that may have been used without any special regard. Also, as we peer back through time each phase of use is alien to each other, and largely self-contained and unconnected to what came before or after it. It is not that all the previous uses ‘knew’ each other and that only us, in the ‘now,’ are strangers to a happy club of former uses. No, what captures the attention most is glimpses of uses that are all quite different to each other, and separate in time, on-site location and nature from each other. This pausing to look and trace back what has now gone gives us scope to think about how other people – other generations – might have gone about their use and arrangement of what would to them perhaps have seemed the only form in which this site could exist. As part of my contribution to the Furnace Park project I have been working through old maps and Sheffield City Council’s photograph archive, in order to summon some sense of these former incarnations of this now scrub-land site. In what follows I give some glimpses of what I have found, and how it has struck me, in a more enthusiast-than-professional style. Half of the site – that part nearest to The Ship Inn and the dual carriageway – is now just a bare concrete pad. Weeds thrust up through cracks in this now deteriorating surface. Remnant rich red brick walls flank this pad, the only signal left of the large building once standing here. For this portion of the site was formerly the Council’s Street Lighting Department’s depot. Here’s a view of the building, as far as I can tell it was demolished in the 1990s, the demolition debris then spread across the other portion of the site. What strikes me is the purposefulness of this image. Almost like a child’s impression of a depot. Vans loaded awaiting despatch. A place of municipal action. A place dedicated to keeping the lights on. And archival photographs can also take us inside now-absent buildings. I love this photo. Here is order and purpose in abundance – a floor to ceiling organised system of purpose, everything assigned its place. The contrast to the site today is quite extreme – this depot occupied the site vertically as well as horizontally. There’s lots of empty airspace now, where once these stacked racks sat, reaching up to the rafters of the depot building. The Doncaster Street end of the site started recorded life (in 1860s mapping) as dense court style housing. Much of this was demolished in an early 1920s slum clearance project. The archive gives us – perhaps – a glimpse of the planning of that erasure. 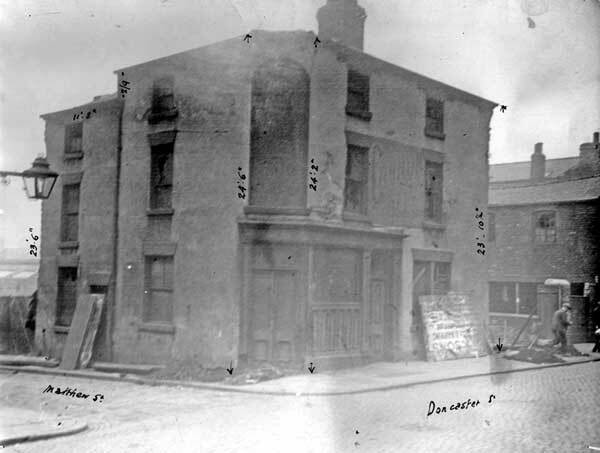 Here’s an annotated image of the Doncaster Arms pub, that sat on-site at the corner of Matthew Street and Doncaster Street. The pub appears already to have been shut-up, ready for demolition. The photo comes from the Council’s City Engineers’ Department’s papers, the measurements inscribed onto the image likely part of the compensation calculation for the compulsory purchase of this derelict building in the run up to its demolition. And at this place, there is a particular poignancy to the idea of bringing play off the streets and into a space specifically set aside for it. For what is now the HSBC offices site on the opposite side of Doncaster Street to the Furnace Park site used to be the Daniel Doncaster & Sons’ foundry. 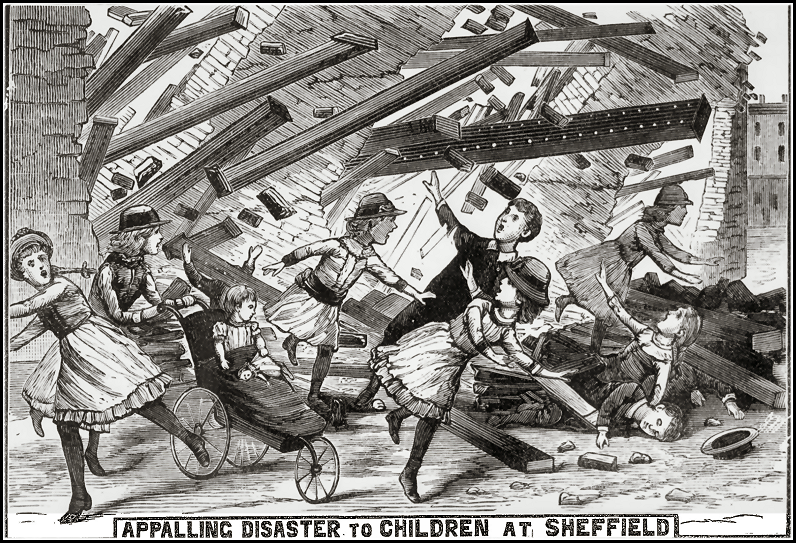 Here on Wednesday, 25th August 1886, at around 5pm the 18 feet high wall of Daniel Doncaster’s stockyard gave way, raining hundreds of tons of steel and iron bars, bricks, roofing timbers and slates out into Matthew Street, and onto a group of local children playing in the street. Eight died: Martha Armitage (aged ten), John Armitage (two), Henry Crisp (six), William Cullingworth (seven), Clifford Anderson (seven), Samuel Oates (five), William Henry Ward (five) Herbert Crookes (five). I’ve found no suggestion that the playground opened in 1931 was intended as a memorial to these children, or that it reflected particular concern about street-play in this particular inner city location. J.G. Graves set up a number of playgrounds around Sheffield around this time. 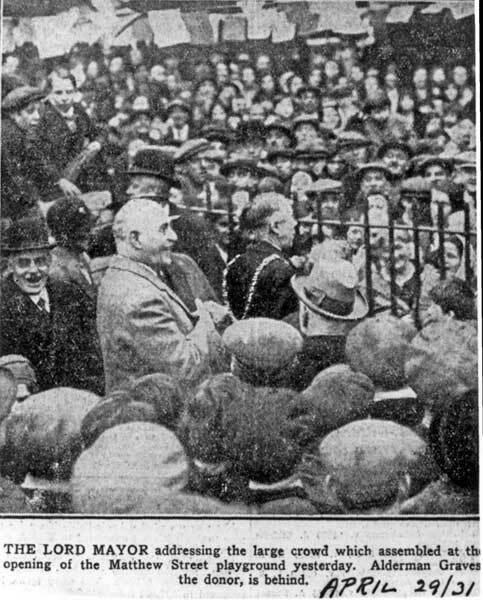 The post-slum clearance open plot bounded by Matthew Street and Doncaster Street lent itself well to a philanthropist seeking a site for a modern life-enhancing playground. Also, the 1886 event and the 1931 opening ceremony were 45 years apart. Two generations. Two different phases in the life of what now is set to become Furnace Park. Today, I find myself back at the site. I’m sitting by the Cementation Furnace (can it really be that it’s the last one left in the world?). I’ve now been to the site many times. There’s never anyone visiting this industrial monument, its plaque and brick recessed viewing point. I’m sat here looking across at the park-to-be site, my view partially obscured by a familiar line of tired cars awaiting attention in the hanger shaped garage nearby. 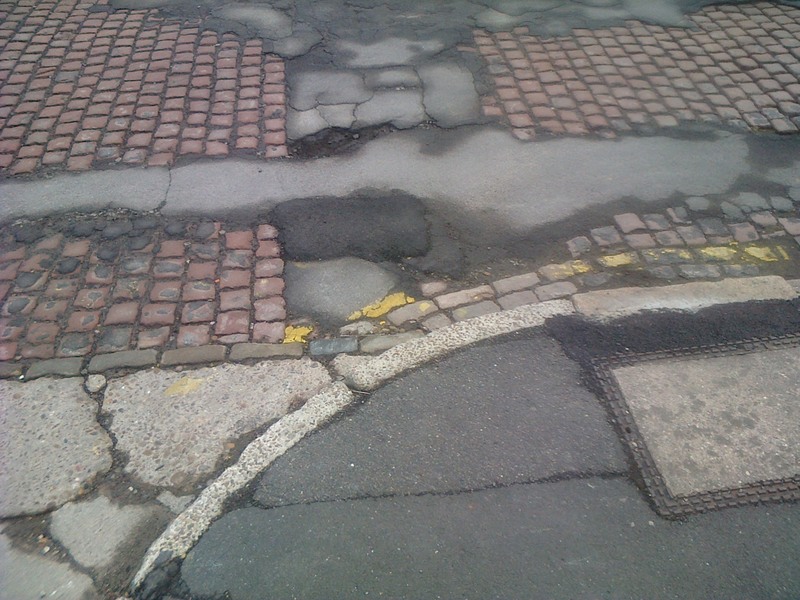 The street beneath my feet is a patchwork of eras of paving, a mix of cobbles, tarmac, faded yellow lines and scuffed curbstones. By coincidence I’m wearing a suit today, and as I stare at my shoes I wonder whether what I wear shapes how I read this place. Hardly anyone passes by. I look and I look and still all I see is a scrubland site. I came here to commune with the ghosts that the archive tells me I should find here in abundance. But today this is a mundane non-place: move-along, there is nothing to see here. Yes, this is the kind of place that only makes sense as a crime scene. I look across to the corner of Matthew Street and Doncaster Street, the site of the Doncaster Arms pub, demolished a century ago. The fat old television sits forlornly face down on the crumbing pavement, about where the pub’s threshold once was. That TV didn’t quite make it into the site. Perhaps the fly-tipper didn’t even try to launch it over the fence, and just casually flopped it out of the boot. Or maybe, with strained back, they gave up after several attempts to manhandle it over. Who knows. There is no record in the archive for this non-event, this act of disposal, this attempt to erase a thing: pre-owned becoming de-loved. I walk along the Matthew Street edge of the site. Can I see the footpads of the then state-of-the-art playground swings and see-saws proudly unveiled at the 1931 opening ceremony by the Mayor and Alderman J.G. Graves, whose donation this start of the art playground then was? No, all I see is rubble, scrub and subsequent over-fill of this plot. I walk on further down Matthew Street, to the littered bell shaped main entrance, beyond is a flat scrubby plain, bounded by fragments of spalled brick walls. 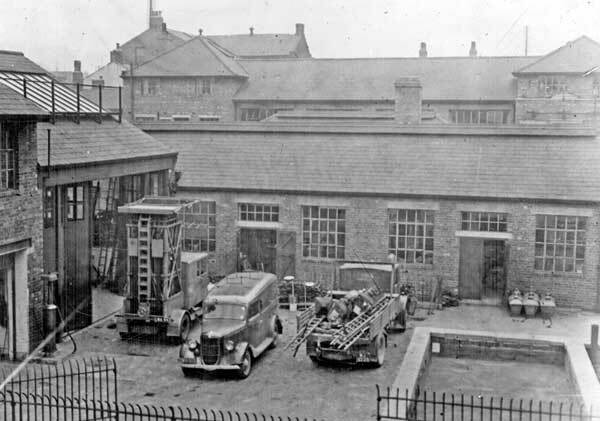 Here was the Council’s Lighting Dept, in its day a proud-looking multi-levelled municipal compound of workshops, stores and offices, the hub from which the city’s street lighting was maintained. But the place that once helped us to see Sheffield’s streets is now invisible, erased, gone: building and all. 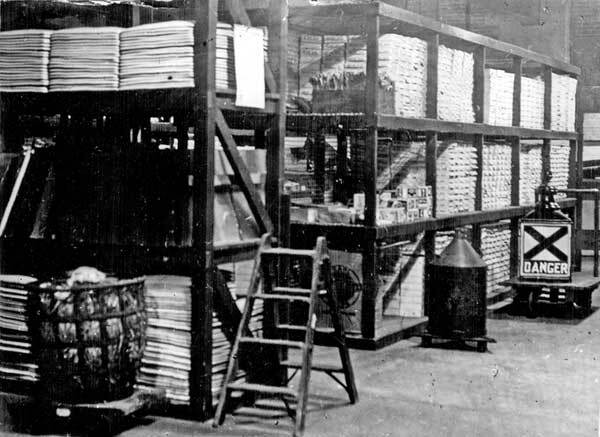 Yet, courtesy of the Council’s photograph archive, I have recently peered into this now non-existent building, my eyes have traversed the ordered racks, signage and stepladders – a dense vertical occupation of this now empty space. I have sat and stared at photographs of the depot and the playground, straining to correlate each to each other and to the current lie of the land. I think I have worked it out, but I must distrust this achievement – for, if someone had thrown in a faded picture of a playground or workshop from somewhere else, I fear my mind would have managed to persuade me that that view too was part of the former lives and arrangements of the Furnace Park site. For, along Matthew Street I see the truncated roads, the exposed layers of street surfacing, the fragments of walls that linger untouched in this deadzone. These may be swept away by redevelopment someday, but until then this space is limbo. But those traces are partial, and each layer erases some of the traces beneath. The tarmac of the playground hid the foundations of the 97 back-to-back houses cleared here in a 1920s slum clearance scheme (a scheme reported with pride to a Parliamentary committee in 1927 and proudly recorded for posterity in Hansard as one of 91 schemes approved since 1919 for the “improvement of unhealthy areas”). The convenient spreading of the rubble of the Council’s depot then in turn overtopped the by now perished surface of the playground. The park project will see that surface obscured by geotextile and/or a carpet of pallets and in turn, perhaps, some more permanent erasure as the site finds future purpose when the commercial appetite for marginal sites returns. I turn and walk back down Matthew Street. I reach the junction with Doncaster Street. Matthew Street used to carry on across from here, into what is now the car park of the HSBC building. Here, until the 1950s was Daniel Doncaster’s foundry. Here, in 1886 was Daniel Doncaster’s stockyard. Here, was where the 18 feet high wall of that abundant place gave way at 5pm on Wednesday, 25th August that year and tonnes of steel and iron bars, bricks, roofing timbers and slates fell onto a group of children playing in the street. I conjecture that perhaps Graves’ playground was intended as a memorial for this tragedy, something for the memory of these street children, but then the maths pulls me up short. Forty years separate these events. They were alien to each other, just as we and the site are now alien to either of these former eras of use. In the long retreat from essentialism, prevailing orthodoxy has it that the experience of place is multivalent, partial, subjective and/or pragmatic (e.g. Creswell 2004; Harman 2009, Delaney 2010). 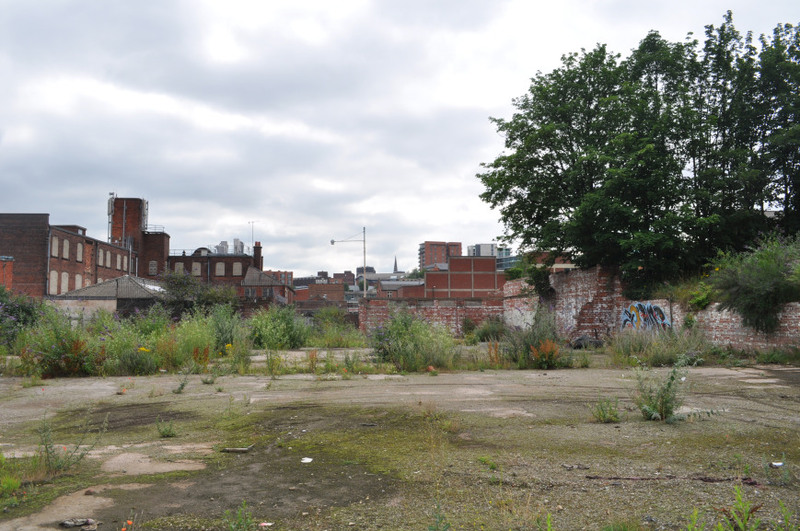 In this paper we will explore what this means in concrete terms by examining our involvement in the valorisation and art-led repurposing of a small plot of derelict land in the heart of Sheffield’s industrial quarter. At the core of our project has been a conscious desire to reveal and then linger over the multiple ways in which stakeholders associated with this project have each brought their own ‘ways of seeing’ (Berger 1972) – their aesthetics in the widest sense of that term – to bear in making sense of the site for their purposes. Through this the project has seen a small abandoned scrubland site suddenly heavily traipsed by police, surveyors, writers, engineers, artists, scavengers, architects, police, film makers, ecologists, poets, lawyers, children, groundworks contractors and ambivalent bystanders. We will show how these visitors are strangers to each other, and this place, and yet through their proximity in time spent on site, their involvement in the project and the similarities and divergences of their sense making strategies, their paths, thoughts and actions start to interweave to create a rich, vibrant set of place-forming narratives for a supposedly ‘non-place’ (Augé 1995). In bringing these ways of reading out of their disciplinary silos, by creating a context in which their discursive grip of the situation was rendered slightly askew – we summoned intriguing patterns, commonalities and charming juxtapositional effects (Highmore 2002), a loose project specific community-assemblage of the type theorised by Jean-Luc Nancy and Jacques Rancière, that energised this forgotten site with new life, colour and purpose.